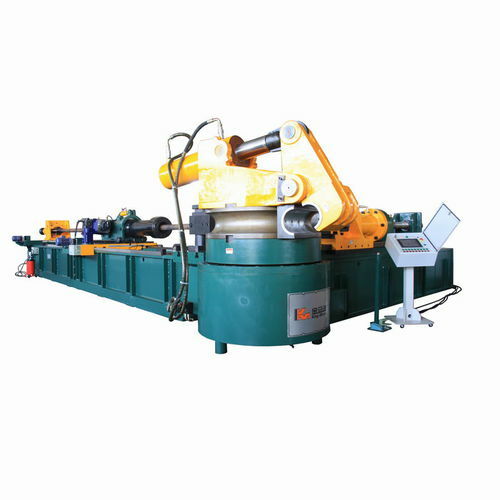 Heavy Duty Pipe Bender-Without Bending Arm Style, CNC Pipe Bender, which controlled by PC based industrial computer, uses special softwares and technology. They are driven by multi-axis of servo motors and servo hydraulics.It can bend tubes with circular flange. 1.PC based computer adopts WINDOWS XP operation system. 2.Auto feeding and angle rotating function. 3.Multi-radius and tooling change function. 4.Data input: Y.B.C or X.Y.Z. YBC and XYZ interchangeable. 5.Create craft files from a drawing. 8.Material rebound and elongation compensation function. 9.3D Simulation and interference function. 10.Diagnoses and Warning of wrong information. 11.Feeding Model: End grip and recapture. 12.Program transmit: (1)Flash Disc (2)Internet (3)Compact Disc. 13.Prevention of ovality and wall thickness reduction functions.